Jewelry is handmade by Revedefille, crafted with raw brass or copper, cutted, hammered, and engraved by hand. The hooks are also handmade of brass, not much allergenic. Clean with vinegar and salt. Très jolies boucles d'oreilles et reçues très rapidement. 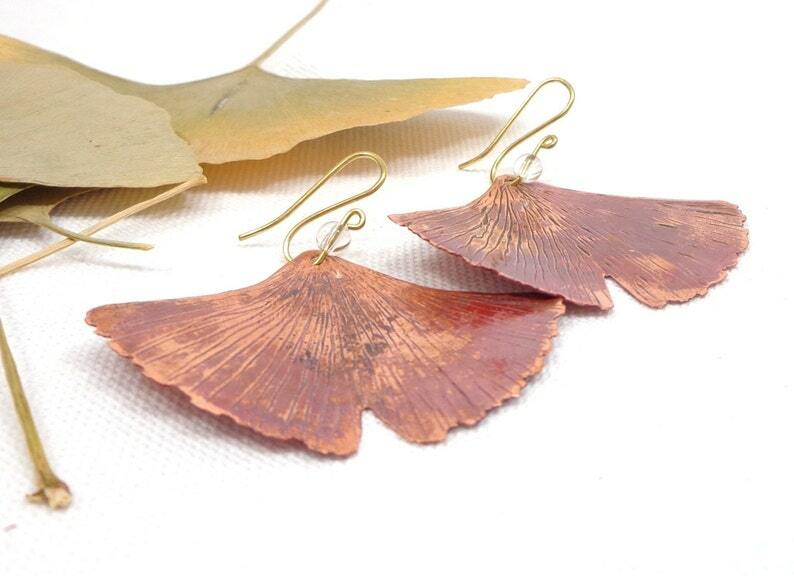 Copper ginkgo pendants, Ginkgo vintage copper earrings, leaf copper earrings, boho wedding jewels. Lovely craftsmanship! So pleased with these beautiful earrings. I will wear them often. Personal, recyclable packaging was a nice touch. Shipping was quick too. Copper Ginkgo necklace. ginkgo leaf pendant, ginkgo red and black necklace, elvish copper jewel, nature trend necklace, leaf trend pendant. Amethyst Ginkgo earrings, Big golden Ginkgo earrings , Leaf golden earrings, purple and gold earrings, bobo earrings.